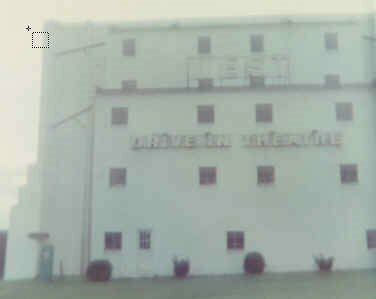 This brought back a host of memories about drive-in theaters because my paternal grandparents owned "The West Drive-in" in Buckhannon, WV, for many years. I thought it was really cool back then that we were allowed to go into the snack bar and eat just about anything we wanted, but we always had to "mark down" what we ate so my grandfather would be able "to do his books." Anyway, my grandfather was pretty forward thinking and had his house built up on the hill behind the drive-in movie screen. He actually had those horrible speakerphones in his bedroom with a huge window so anyone in the house could watch the movie from the porch, his bedroom, and a family room that was located on that side of the house. I guess at the time it was what you would call his own "surround home movie theater." Granted, the sound really sucked in those speakers but still pretty ahead of his time. I remember that as kids we were not allowed to go in the projectionist's area while the movie was running because my grandmother was afraid the projectionist would get sidetracked and miss the correct time to "change reels." When this happened, it was a white screen and most of the cars would honk their horns until the movie started again. When I look back now, I think of all the hard work it took to run the drive-in. My grandparents always started working early in the evening to get ready for the nightly movie/s. The phone at their house was also the business phone so it would start ringing early afternoon so people could listen to the nightly features for the week and see what was playing. There was always a double feature on the weekends and they held special events on holidays. On July 4th, they always had fireworks and my grandfather, dad, and other friends and family would "set off the fireworks". It was a tradition that the last big finale firework would have a little parachute guy in it and anyone who found the parachute got a free admission to the drive-in. When I think of my grandmother, I always remember her in her little ticket booth. She was the main ticket seller for as long as I can remember. I can't even imagine how many tickets she sold over her lifetime but she continued running the drive-in for many years even after my grandfather died. One of her jobs was at the end of the night when she had to drive around the movie yard and wake up patrons that had fallen asleep in their cars. I would be dosing in her car and can remember the stops and window knocks. At the time, I didn't realize the significance that most of her window knocks were for cars in the last two rows of the movie yard. Thinking back on that, I later understood the "fogged windows" and why she never let any of the grandkids do the window knocking. After my grandmother died, my aunt ran the drive-in. When drive-ins slowly went out of fashion and she stopped running the drive-in completely, she let the locals hold flea markets on the property. When my kids were younger, there was a drive-in located in the town where my parents lived in WVa. We always tried to have a drive-in movie night when we went to visit. All the aunts and uncles and cousins that lived in the area, would go. I forget how much it cost to get in, but it was usually by the carload. We would take stuff to sit on, blankets to wrap up in, snacks to eat, and bug spray. The kids would usually run around and play at the playground until it turned dark. Most of the kids would be asleep before the movies were over. It was always fun and very nostalgic for me. That drive-in has been out of business for many years now. I was surprised about the number of drive-ins during their peak. 4,000 in the nation, with 388 located in Texas. I thought it might have been more nationwide but Texas dropped down to 11 drive-ins in 2000. That number is now 21 drive-ins in Texas. I have such fond memories of drive-ins that I wish everyone had the opportunity to give them a try.If you get a chance don't pass it up to go to a drive-in! As they say: Come to the snack bar for delicious snacks...and 2 minutes until the movie! 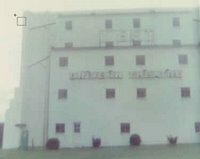 I remember the remnants of the West Drive through, I think I was alive to actually see that building in the picture before it was knocked down. I believe it's now a residential neighborhood. Always loved hearing stories from Papaw and Mamaw about that place...as well as the stories of mom and sisters/cousins watching the movies from the house with the super cool speaker system. I also remember catching a few drive-in movies, including Jurassic Park, believe it or not. I have a feeling when I have kids they won't ever get to experience this type of thing...kind of sad. Other than having to douse yourself in mosquito repellant for a movie in the summer, it was pretty fun. i remember seeing independence day. that's about it. that and getting bit by mosquitos. and fallign asleep during the movies. that's all. One of my fondest memories as a child was going to the drive-in in our PJ's to see the newest Disney feature! Every kid had on their pajamas as they swung, whirled and ran crazy on the playground! You were NOT COOL if you didn't wear your pajamas! As a matter of fact, we still go to the drive-in -- Wellfleet Drive-In every time we vacation on the Cape (Cape Cod, Massachusetts). During the day, they hold craft fairs and flea markets, but watching a movie from the comfort and privacy of your own car come nightime is THE BEST! It is one of the highlights of our vacation and one that the kids really look forward to--especially if we are able (due to the ratings of the movies) stay for both features. Sometimes we even luck out and get to go twice in one week because the movies change on Fridays. When the girls were really little, we would go have dinner, play a round of mini-golf, let them play at the playground for a little while, change them into their PJ's and then settle in for the movie (complete with blankets--it's NEVER hot there, pillows and bug spray). Of course we would have to visit the snack bar before the movie and then again during intermission! (They ALWAYS looked forward to the advertisement for the Snack Bar complete with dancing hot dog, popcorn, candy and soda!) With any luck, they would fall asleep right after the first feature, and my husband and I could stay for the second. The difference today is that now the speaker system is as good as your own car radio/speaker system--you tune in to radio station FM 89.3! Although, if your car doesn't have a radio (probably very rare in this day and age), you can still hook the mono speakers to your car window. We usually have to do this for a little while, you know, just for the effect! One of my family's favorite memories of the Wellfleet Drive-In is the year that we visited during a meteor shower! The sky was clear, the air was crisp, and we were all snuggled up in our car; and as we watched the movies, falling and shooting stars were everywhere--could it get any better than that! I am happy to hear that there is one more NEW Drive-In in the country. I would hate to see them all disappear. I agree, if you get a chance, take the family and visit a drive-in!!! Thanks for the comments from the McDonough crew..I'm glad that some out there have experienced the wonderful drive-in experience. There really is nothing like it! I am glad that the radio/car sound has improved over the years and I chuckled when Bobby wrote about the xrated movies. There used to be an xrated drive-in on this old stretch of road in WV. I often wondered if that stretch of road had more wrecks than usual from people craning their heads to catch the action. Doubt there are many xrated drive-ins now with the Christian Coalition being so vocal. I have a Lot of memories of going to "work" with Dad, taking you guys along, in pajamas, to the drive-in. You could go in the projection booth for a short time during the first reel, then we had to scoot out. I really did not totally realize what a job it was to keep those machines running smoothly. I do know that Dad did a lot of scurrying around, and what a PAIN when the film broke. He had to move super fast to get it spliced back together. It was sort of unfair that you girls could not work in the snack bar when the boy cousins (about your ages, could) My Mom could wax on and on about that! You really did have the fun part of eating there without the work!! I can't remember much about taking you to the Colonial theater, probably didn't much then because you were so young, and quiet was called for inside. The swimming pool was a mixed blessing in that you were nap age and the pool opened at 1:00 every afternoon. You three had a small bedroom that you shared, with the windows facing the pool with all the kids yelling and having a great time. I didn't get to take a lot of advantage of three sleeping little girls for having to come in every little bit to lay you back down and close the blinds. The good part of being there, we could go swimming without the crowd when Dad came home from school, before he had to go to work at the drive-in. The "Good Ole Days" sometimes look "gooder" when looking back!! you certainly remember more than I do about that era of our life....but that/s rigiht..you're the baby so you get to stay with the car....I , on the other hand, got sent to the house to go to bed....what was up with that?? Like I was safer in the house with Vicki? and where were our parents when we were supposedly watching the movie and NOT helping in the snack bar? Oh well..that is why they call them "childhood memories"
I live with my wonderful husband and the best dog in the world, Lucy. I have 3 sons and two very sweet daughters-in-law.